Birch Aquarium is one of San Diego’s best attractions and not your average aquarium. 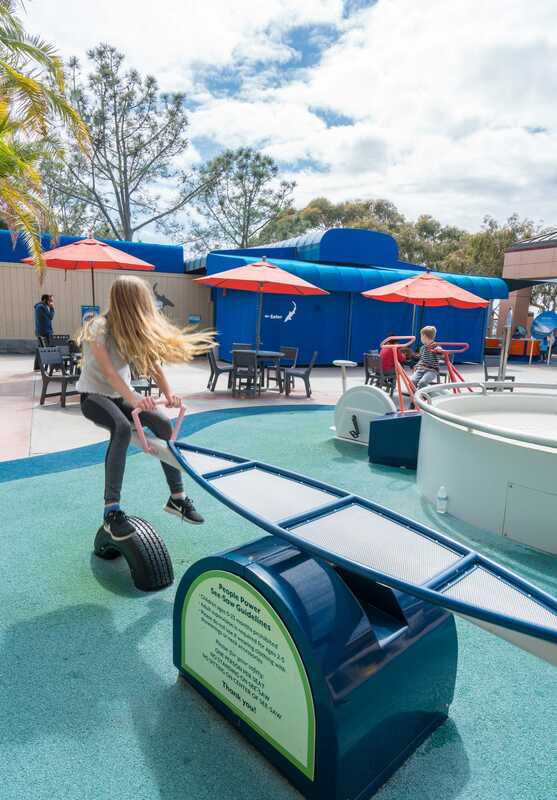 The hands-on exhibits and over 60 fish and invertebrate habitats showcase the research and findings of the famous Scripps Institution of Oceanography, one of the largest centers for ocean and Earth science research. Programming for both locals and tourists extends far beyond the aquarium itself. Seasonal adventures that meet in various San Diego locations encourage all ages to get outside, unplug, explore, view wildlife, and learn more about how we can better care for our local environment. And, Birch Aquarium offers a myriad of opportunities for kids to experience what it’s like to be a scientist, resources for educators and outstanding summer camps. Who Is Birch Aquarium For? 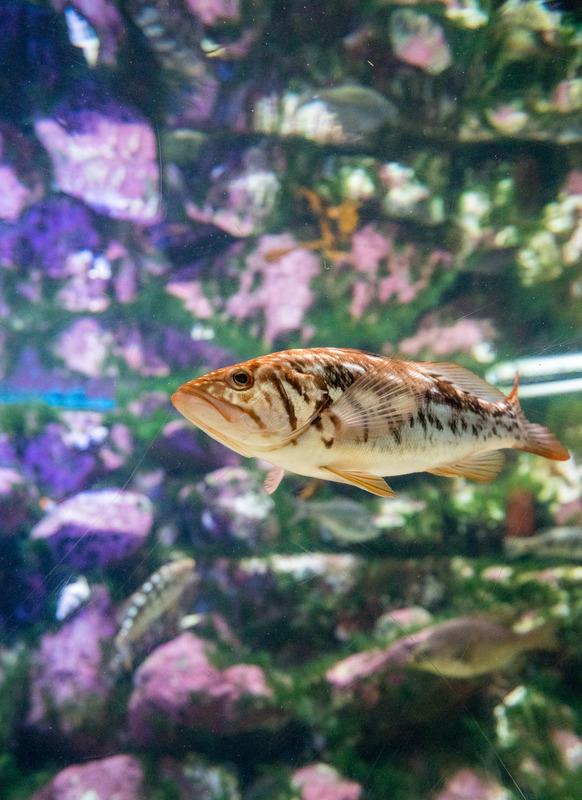 A powerful conservation message is woven throughout Birch Aquarium, which is accredited by the Association of Zoos and Aquariums. We’ve been visiting the aquarium for nearly 11 years. It’s a treat to watch the kids pick up something new and exciting to them every single time. 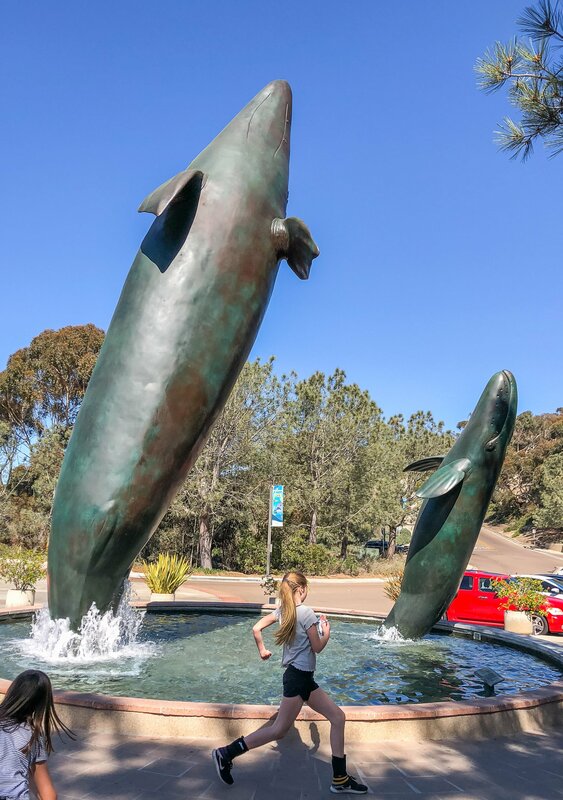 Birch Aquarium’s location in the La Jolla Shores neighborhood is just a few minutes away from the I-5 freeway (San Diego’s major transportation artery) which means convenient access from the rest of San Diego. And, it’s easy to pair a Birch Aquarium visit with stops at other La Jolla attractions. The facilities are also straightforward to navigate, especially for young families with strollers. The entire aquarium is accessible, and it doesn’t take long to get from one side to the other. It’s easy for kids to dart back and forth between favorite exhibits. This, combined with spectacular ocean views is why I’ve never found visiting to be stressful. An average visit typically lasts between 2-3 hours. Shows and feedings occur at various times throughout the week so check the daily schedule to plan around events of interest. Drinks and snacks are entirely fine to bring in but not necessary as they can be purchased at the Splash! Cafe. You’ll find plenty of places, including the Splash! Cafe patio to sit, relax and grab a bite to eat. Changing tables are also available inside the restrooms. Everyone. There isn’t an age group that can’t enjoy Birch Aquarium and its programming. 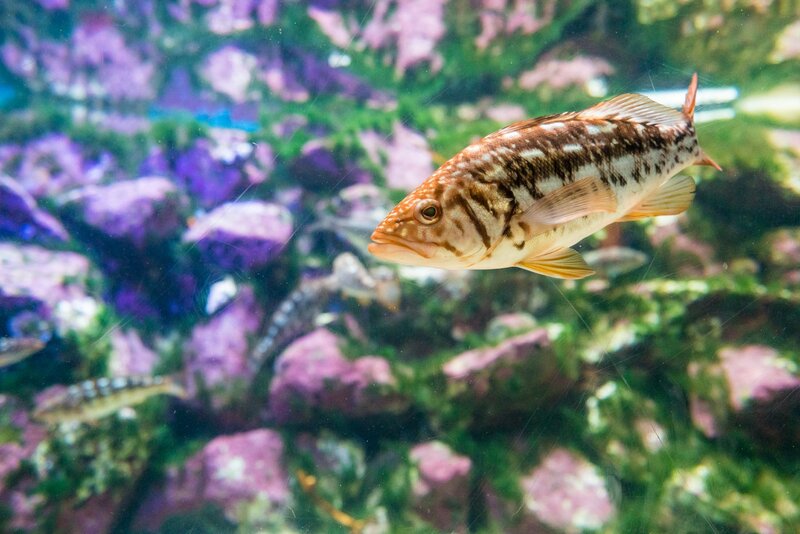 I used to believe that the aquarium was best for toddlers and preschoolers but these days, you’ll see plenty of adults practicing photography, tourists and even older kids revisiting favorite exhibits. You will get more out of your visit by taking a few minutes to understand what you’re looking at and why it’s on display. Here’s what to expect inside the aquarium listed in the order that the kids I’m with typically choose. Enter Birch Aquarium via the lobby. Here, the Pacific Sardines tank is likely to lure you to the right, into Hall of Fishes. It’s also not uncommon for kids to want to take a second spin around Hall of Fishes before exiting for the day so you may want to plan extra time for this. Did you know that in the right conditions, kelp can grow up to 3 feet per day? You’ve seen it onshore but take a look inside the two-story Giant Kelp Forest to see how kelp grows underwater and who lives among it. 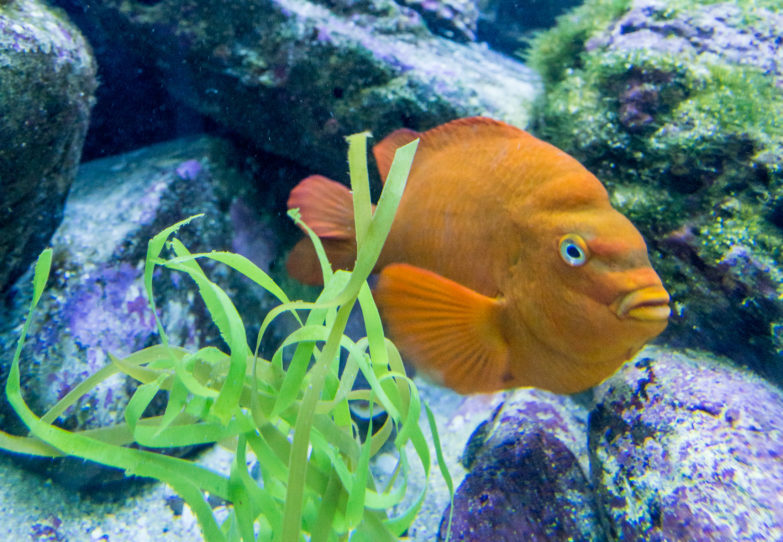 Residents include the orange Garibaldi (California’s state fish) leopard sharks, eels, the giant seabass and more. 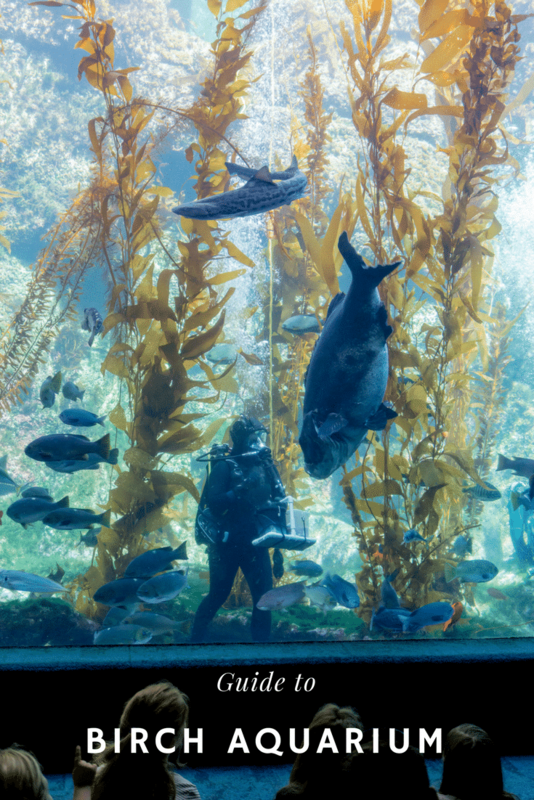 Check the daily schedule for the Kelp Tank Dive Show, where divers in the tank answer audience questions and talk about how many of the products we use daily use kelp as an ingredient. You’ll be able to watch divers feed the fish, too. Arrive a few minutes before the show starts for optimal seating. You can also view tank happenings through the online Kelp Cam. Cute does not begin to describe the loggerhead sea turtle who is now in residence permanently at Birch Aquarium after being rescued from a New Jersey power plant in 2013. Rear flipper paralysis and scoliosis (likely due to trauma before her rescue) deems her unreleasable. 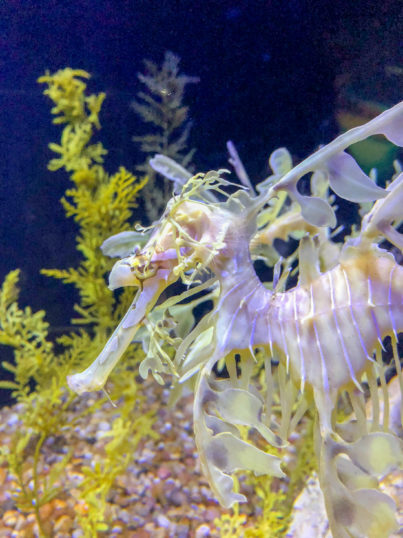 The combination of CT scans and 3-D technology enabled staff to create a brace to place on her cracked shell so that she can grow normally and serve as one of Birch Aquarium’s conservation ambassadors. They hope she inspires others to think about what they do on land and in the water as humans actions are the biggest threat to sea turtles. We’re talking about debris like plastic bags, fishing nets, pollution and more. On Tuesdays and Thursdays at 3:00 p.m., guests can watch the loggerhead sea turtle partake in training and a meal. It’s impossible to miss the brightly-colored 100 Island Challenge just past the loggerhead sea turtle. This experimental reef allows scientists to test equipment and research techniques before traveling to remote locations. Their goal is to collect data from coral reefs surrounding 100 tropical islands around the world to understand better how these reefs respond to changes in our planet. Seasonal low tides during winter months reveal tide pools along San Diego’s coast. The living tide pools in Tide Pool Plaza are an opportunity for all ages to view sea life that lives in our local tide pools. Volunteers here facilitate gentle touching and answer questions. These animals and plants are the heartiest of sea life as they must learn to survive underwater life, rough ocean tides, sunshine and predators on land. 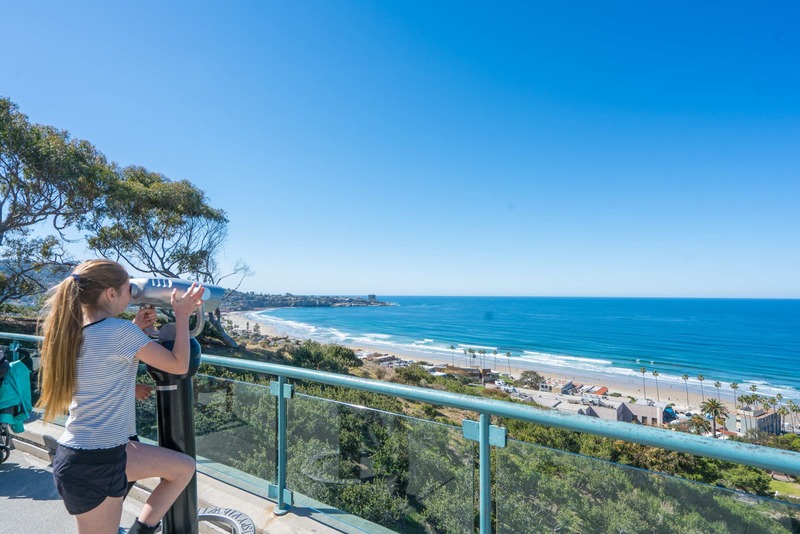 Get your camera ready as Tide Pool Plaza is also home to one of the most spectacular ocean views in San Diego. The Scripps Institution of Oceanography has one of the largest research fleets in the world, including the new R/V Sally Ride named for famed astronaut and UC San Diego professor, Sally Ride. 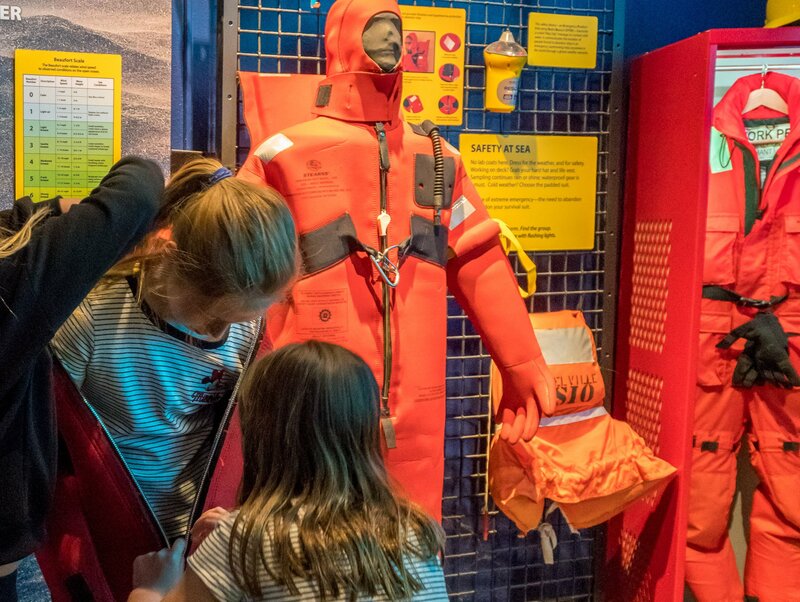 This exhibit showcases more about the ship’s research and what it’s like to be out at sea. You’ll even have a chance to suit up like an explorer. 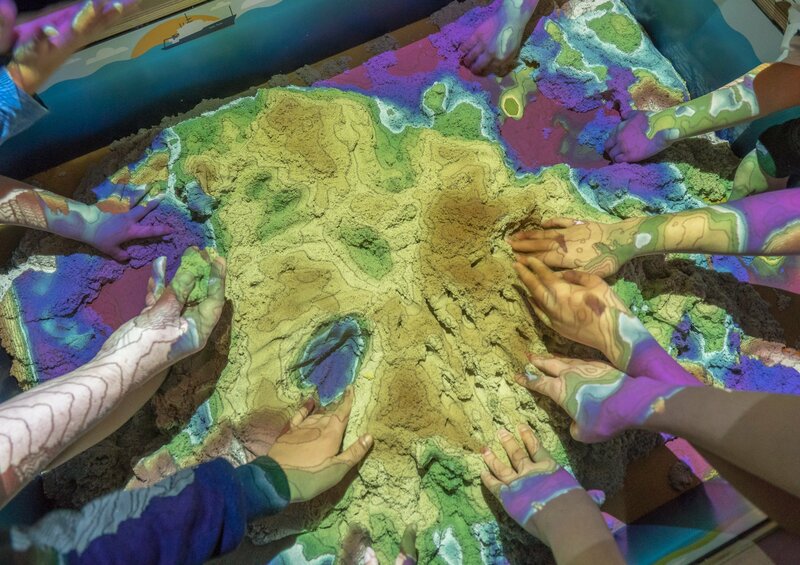 Plan plenty of time for the kinetic sand station that allows kids to shape their own sea floor. The color changes with the sand’s depth, and it’s unbelievably cool. 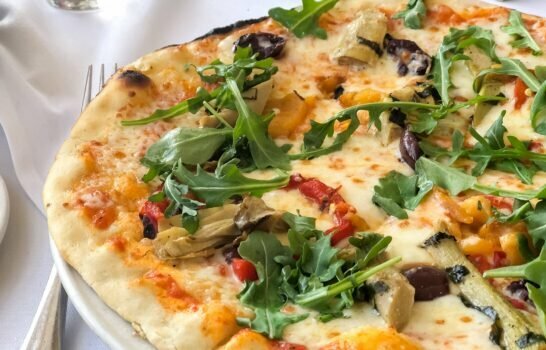 Also on the patio is a tribute to elasmobranchs including La Jolla’s famous leopard sharks that arrive in summer to incubate in our warm water in addition to other sharks and rays. 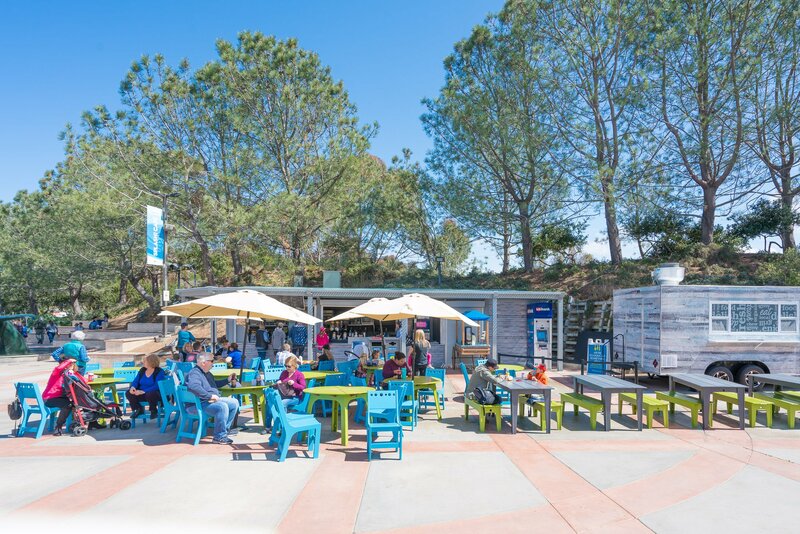 Check the daily schedule for feedings here but keep in mind that in summer, Birch Aquarium leads snorkeling with leopard sharks tours at La Jolla Shores beach. 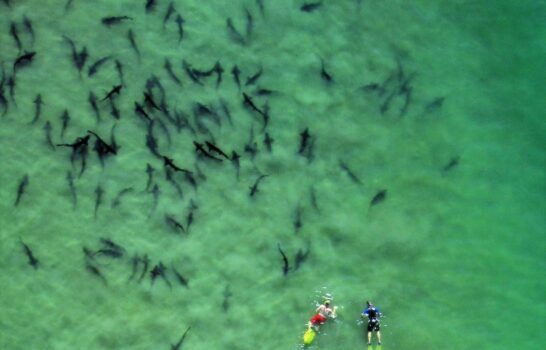 Yes, leopard sharks are bottom feeders and safe to snorkel with. If I had to pick a favorite exhibit, this is it. There’s Something About Sea Horses features a dozen seahorse species and their relatives, And, leave it to Birch Aquarium to discover a new type of Seadragon, the Ruby Seadragon. They’re delicate, colorful and beautiful. Break from the adventure with a meal or snack at the Splash! Cafe by The French Gourmet just outside of the aquarium entrance. 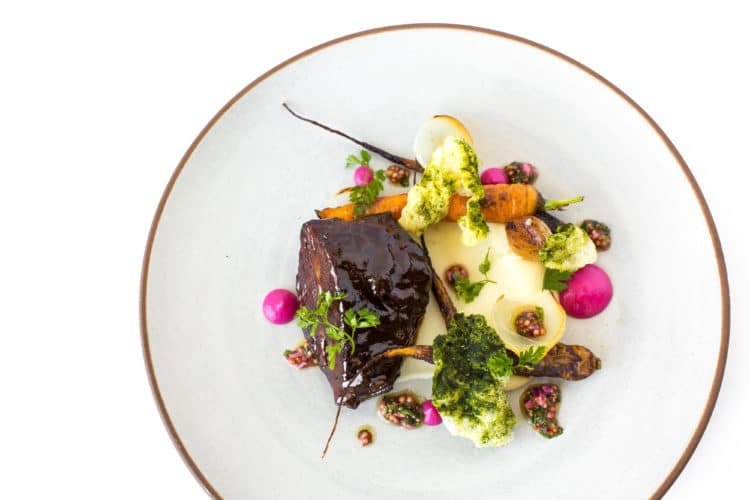 The food is excellent with sandwiches, salads and side dishes made daily by The French Gourmet, a very popular San Diego restaurant and bakery. Inline with the aquarium’s conservation mission, Splash! Cafe serves boxed water and fair trade coffee from Cafe Moto in addition to organic and gluten-free dishes, grab-and-go snacks, and more. The kids I take love the various flatbreads and the fresh guacamole side. Carne asada fries and Ballast Point Sculpin, one of San Diego’s famous local beers, on tap are just a few of the local favorites to enjoy. The gift shop is adorable. Sure, it’s full of stuffed animals and trinkets for kids, but also sea-themed home decor, books, jewelry and much more. If you’re on the hunt for a unique birthday present for a kids’ party, it’s way better than the toy store. One of the best things to do in San Diego during winter months is to keep an eye on the tide calendar for minus tides that present opportunities for tide pooling. Inside these tide pools await critters that delight all ages. It takes a keen eye to spot them, which Birch Aquarium naturalists do have. We took a group of tweens on this winter adventure, and it was so much fun. It’s possible to spy sea cucumbers, sea stars, multiple types of crabs, fish, sea anemones and even the occasional starfish. 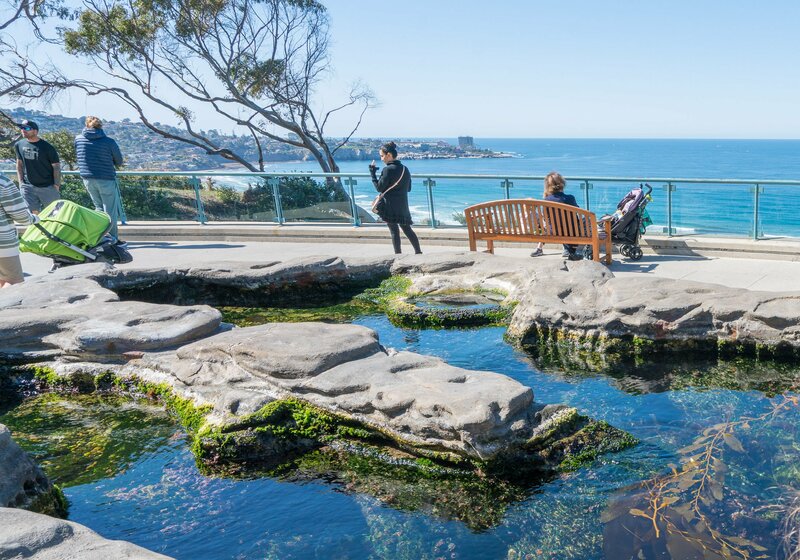 Birch Aquarium leads tide pooling tours at La Jolla Shores near Scripps Pier or False Point, a small rocky beach in the Bird Rock neighborhood. Looking for a little late night adventure? On certain nights during spring and summer, little slippery silver fish called grunion ride waves to the sand during full moons and new moons to spawn. The event is quite a sight to behold. Before the adventure, you’ll have a chance to see a grunion hatch live. Whales can be seen migrating now during most of the year in San Diego. From about December through April over 20,000 gray whales travel round-trip from the Bering Sea down to the warmer waters of Baja California to give birth. And, from May through September blue whales (fin and humpback whales tend to join in, too) arrive in Southern California to feed on large quantities of krill. Birch Aquarium has partnered with locally-owned and operated Flagship Cruises to take guests on whale watching adventures that depart from downtown San Diego. Don’t forget Birch Aquarium when searching for summer camps in San Diego. 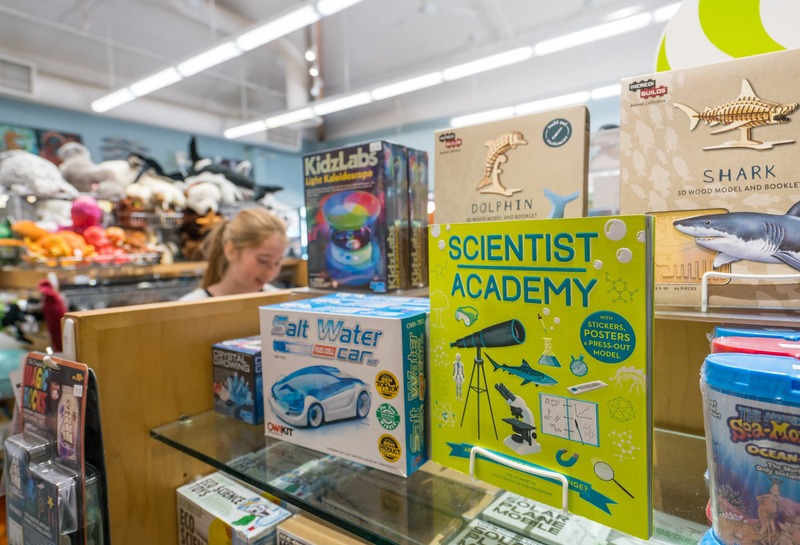 Ages 4-15 can enjoy all things ocean science with a myriad of themed half-day or full-day accredited camp choices based on age. They’re ideal for kids with a budding interest in marine biology or those who just love sea life, crafts and having a good time. Some camps are held at the aquarium while others head to the beach where kids encounter animals while snorkeling and learn about currents and waves through body-boarding. Older kids can visit Scripps scientists in their labs to learn what it’s like to be an oceanographer and even perform experiments. Kids from kindergarten to 12th grade are invited to submit their ocean and earth sciences questions for Scripps scientists to answer. How cool is that? 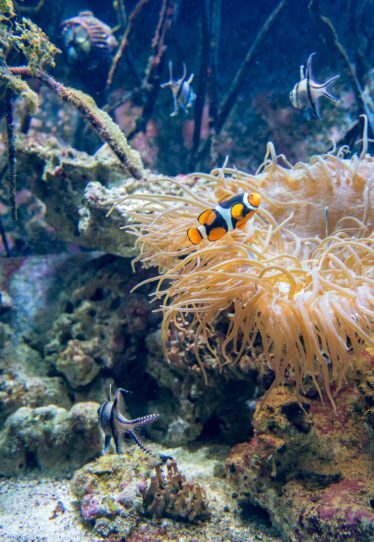 High schoolers interested in pursuing a career in marine science are invited to apply for internships at the aquarium while college students can spend summers as interns at Birch Aquarium’s camps. Think of Birch Aquarium when it comes time to plan a school field trip. Beach Teaches meet at La Jolla Shores beach where naturalists teach kids about beach habitats, data collection, tide pool life and more. Similar field trip programming happens at the aquarium where some grade levels can examine a fish dissection, study fossils and learn different age-appropriate science topics. The Aquarium Express van can even come to your school for hands-on learning in the classroom and there are many other ways for students to benefit from Birch Aquarium school programs. It’s easy to combine a visit to Birch Aquarium with other nearby La Jolla attractions. La Jolla Shores is regarded as one of the best beaches in the nation for a good reason. 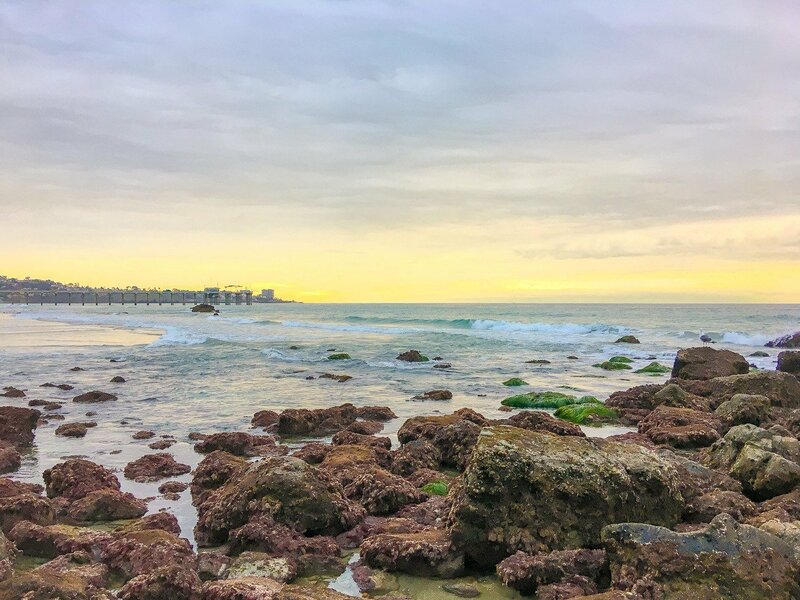 In addition to a wide stretch of sand perfect for sunbathing, walks and sunsets, loads of marine life live in the San Diego-La Jolla Underwater Park offshore. 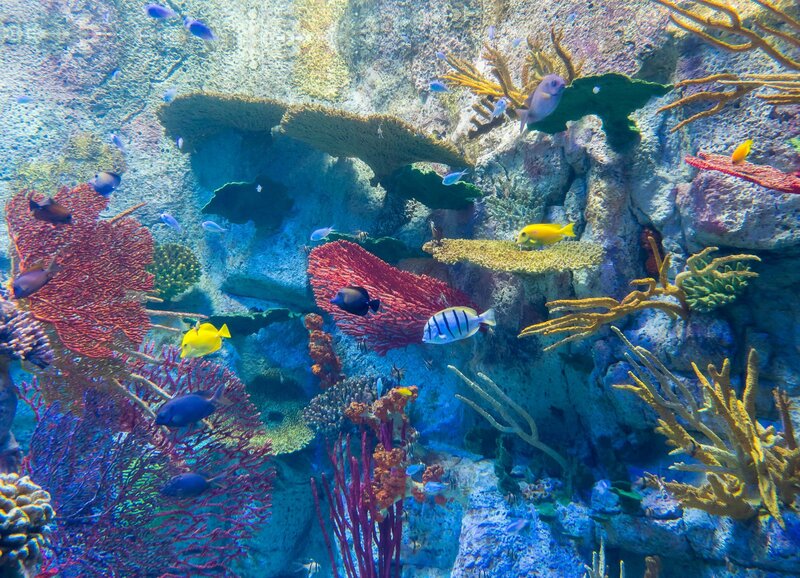 The humanmade park is home to four habitats (rocky reef, kelp bed, sand flats, and submarine canyon) and a popular place for snorkeling and scuba diving. It’s also fun to join a kayaking tour past the seven sea caves, learn how to stand-up paddle board or simply build a few sandcastles here after playing at the seaside playground, Kellogg Park. 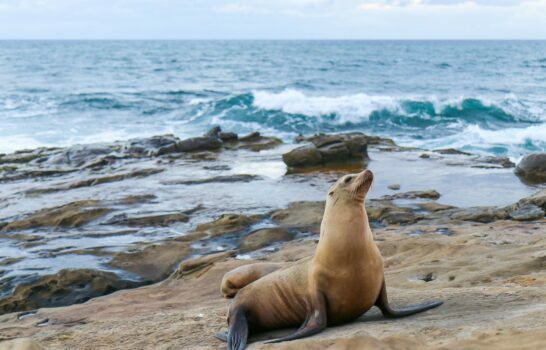 For kids who never tire of sea life, head to the Village to see La Jolla’s famous seals and sea lions. They’re adorable, and usually visible on the sand at the Children’s Pool or on the rocks near La Jolla Cove. North of La Jolla Cove, take a walk inside the only sea cave accessible by land through the aptly-named Cave Store. This family-friendly state park is home to easy trails for walking, hiking and ocean views. Check the website for trail conditions before you go. Bring the camera as you’ll want to capture the colorful gliders launch off the cliffs and into the air at this flight school, which also offers tandem rides for the daring. Watch from the patio or picnic tables of the Cliffhanger Cafe. Always check the calendar of events before arriving to plan a visit around show or events you may want to see. If you do bring older kids, make sure they’re mindful of younger kids as some of the hands-on exhibits are in tight spaces. It’s a favorite place for school field trips during weekday mornings, but I’ve noticed that it tends to be a little less busy on weekday afternoons. Bring a camera but remember to turn off the flash. For best results and less reflection position your camera as vertical as possible and close to the glass. 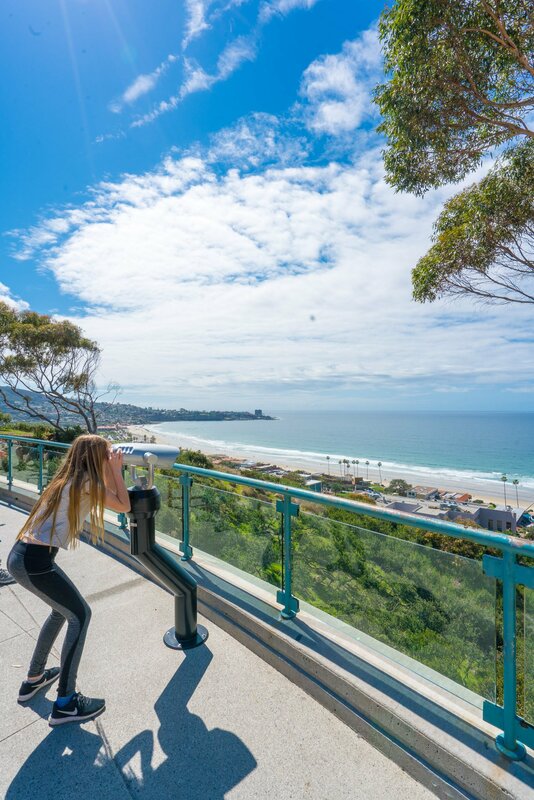 Guests of the La Jolla Shores Hotel can take advantage of the complimentary hotel shuttle for transportation to and from Birch Aquarium. Birch Aquarium is open daily from 9:00 a.m. – 5:00 p.m. Tickets can be purchased online at the ticket booth upon arrival. Birch Aquarium is also part of the popular Go San Diego Card bundled attractions pass. 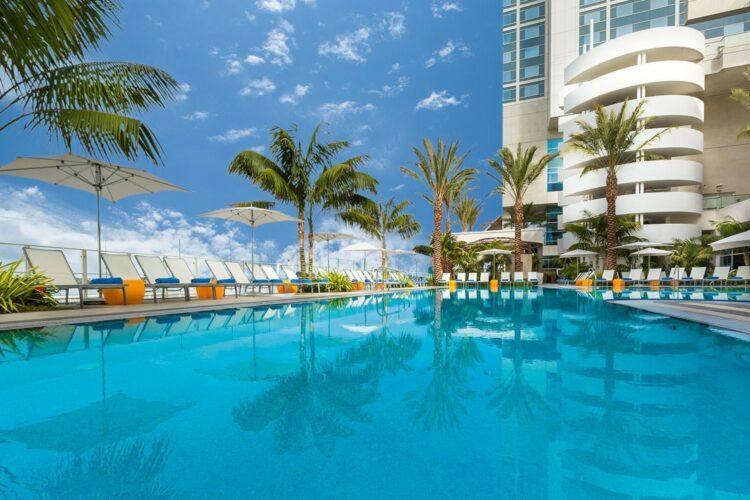 The all-inclusive pass provides entry to 40 San Diego attractions over the course of 1, 2, 3, 5, or 7 days. They also have a Build-Your-Own with savings starting at 20% for just two attractions so be sure to include Birch Aquarium. Members of Birch Aquarium enjoy unlimited year-round admission, by far the best deal for residents and frequent visitors to San Diego. To give you an idea, a family membership is $89 and includes four free guest admission passes, a 10% discount at Splash! Cafe and the gift shop, and access to exclusive opportunities throughout the year. 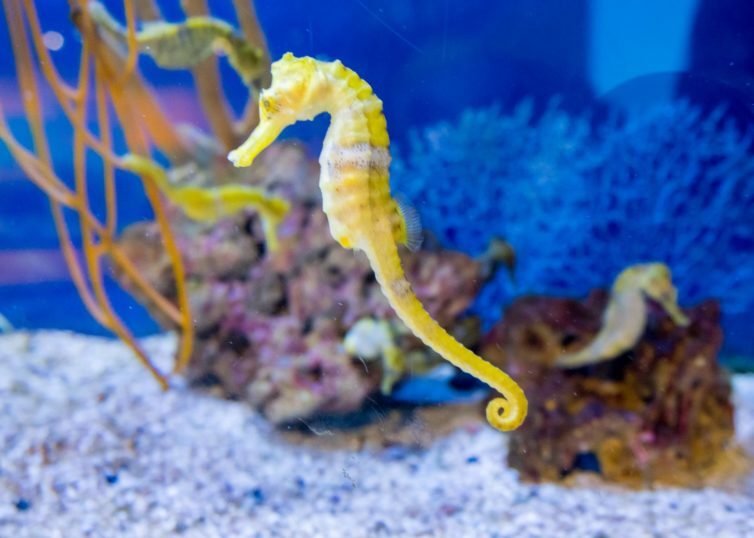 And, you can feel good knowing that membership dollars go toward supporting Birch Aquarium’s mission of education and conservation. I like to remind locals and tourists that the aquarium is multifaceted. 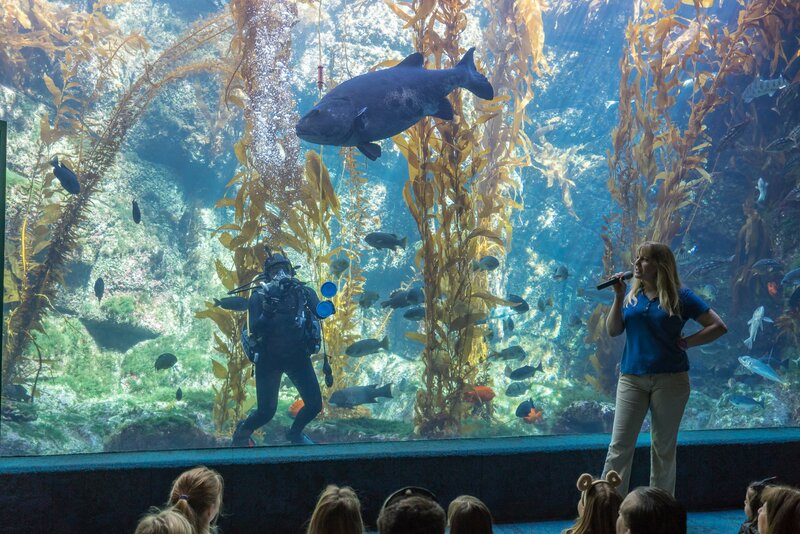 While exploring the aquarium facilities fabulous way to spend a half-day, remember to take advantage of the offsite programming, special events, summer camps and school programs. We are so lucky to have this valuable resource in our backyard. 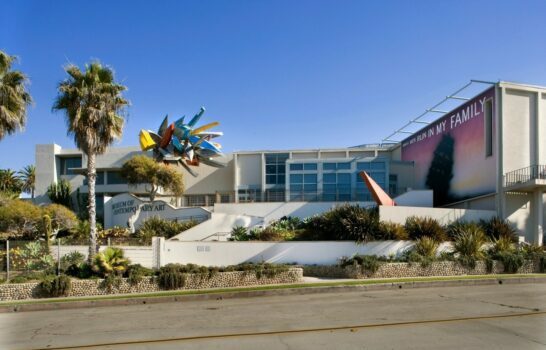 Here is your chance to visit Birch Aquarium! We’re giving away four tickets to one lucky La Jolla Mom reader to use before 12/31/18. All that you need to do is enter via the widget below. Be sure to take advantage of the easy bonus entries, too! 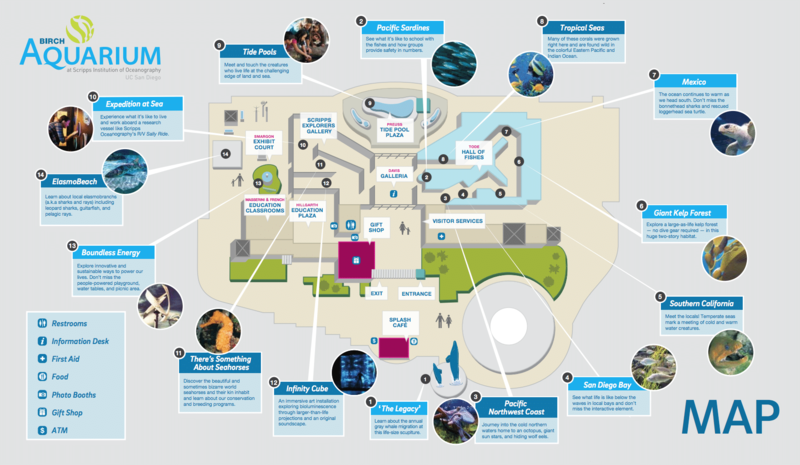 What is your favorite thing to do at Birch Aquarium?